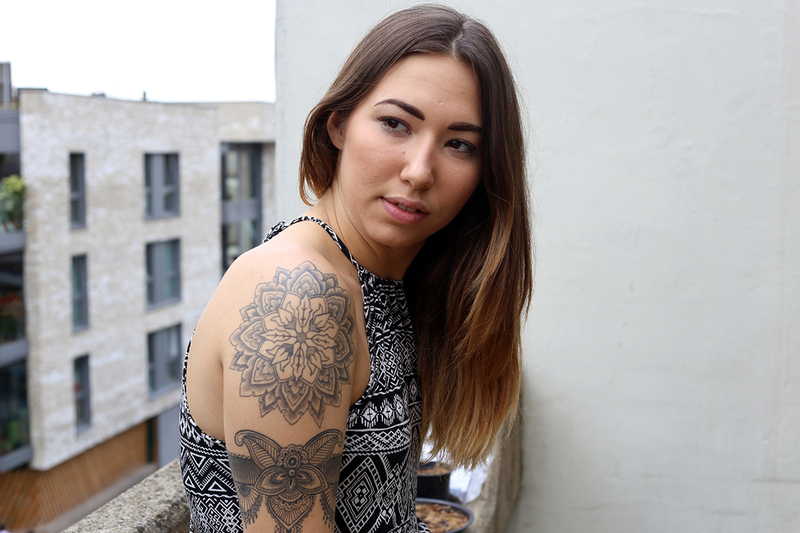 Do you remember what attracted you to getting your first tattoo? My first tattoo (the skull & ‘13’ on my arm) I had on my 19th birthday using money my dad gave me for my birthday. 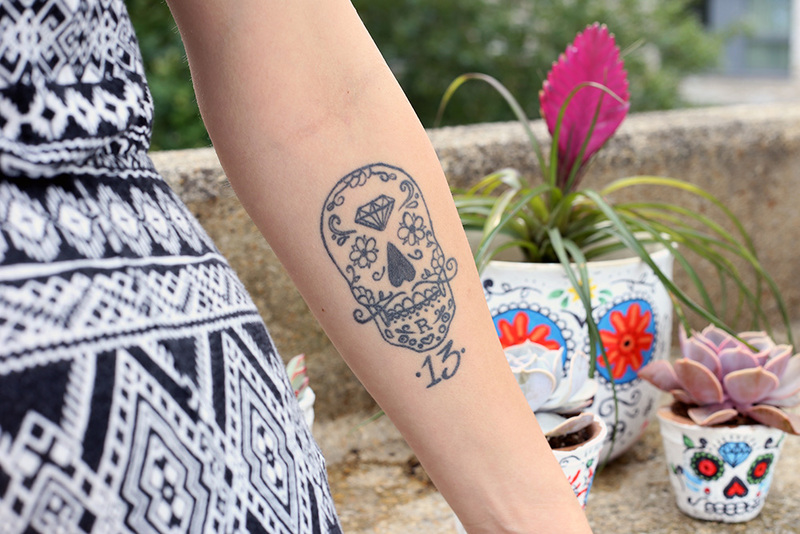 It matches one of my dad’s tattoos that’s also of a skull (although different than mine) with a ‘13’ under it. I can’t remember exactly why I wanted a tattoo so badly just that I wanted one a lot! After my first, I didn’t have another one for about a year, and in the last two years I’ve added another 12 to that first one. You've tattooed yourself and I was wondering how that felt? Does it feel different to when you're being tattooed... for example, do you feel more in control? Yes it does feel different, definitely! A lot of people say “how do you tattoo yourself? It must really hurt!”, but actually, in my experience, it’s less painful than when I’m being tattooed by someone else. I think the reason is because I’m concentrating on what I’m doing, so the pain sort of fades into the background. The first time I tattooed myself was totally random; I didn’t plan it. I was practising using my [tattoo] machine on silicone skin and on an impulse drew a tiny little flower onto my ankle with biro and just tattooed over it. Since then I’ve tattooed myself six times or seven, if I include the one I did on the bottom of my foot that has almost disappeared now. I imagine that to tattoo yourself you need to trust in yourself and feel confident. Is that right or am I overthinking it? Yeah, that’s about right. The first time I was kind of in shock of what I’d done and I think it gave me a huge adrenaline rush. But now I trust myself to do it. I wouldn’t try a design too elaborate or big that I didn’t feel I could do well, but, basically, if you want to learn how to do it, you pretty much have to tattoo yourself to learn, otherwise how will you know if you’re applying the right pressure? Also, how can I expect other people to let me tattoo them if I’m not prepared to do it to myself? Do the tattoos on your arms have a particular meaning? Do they represent something or are they purely aesthetic? They don’t have meaning in the sense that most other people’s tattoos have meaning, for example, to represent a time or person. They represent my love for Asian-inspired artwork. A lot of the work I do myself (other than portraits) is influenced by Asia, specifically India, and has a lot of geometric elements. So in that sense they have meaning to me. Eventually, the tattoos on my arm will all be joined into one full sleeve so I’m quite excited for that. 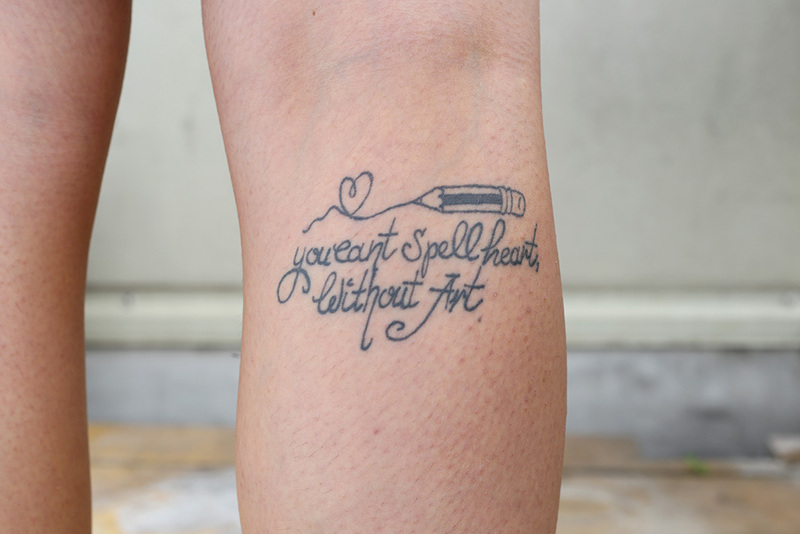 The tattoo on your right leg says “you can't spell heart without art”. What is your relationship with art? I’ve always loved drawing and making things. Most of the women in my family (on my mum’s side) are pretty creative. For me drawing or painting is something I can do that I totally enjoy and it is very therapeutic. I don’t ever remember a time in my life when art wasn’t playing a big part for me. As you may have figured out already I’m hoping to become a professional tattoo artist in the future and I’m currently looking for an apprenticeship. This way I will be able to do something I love every day. 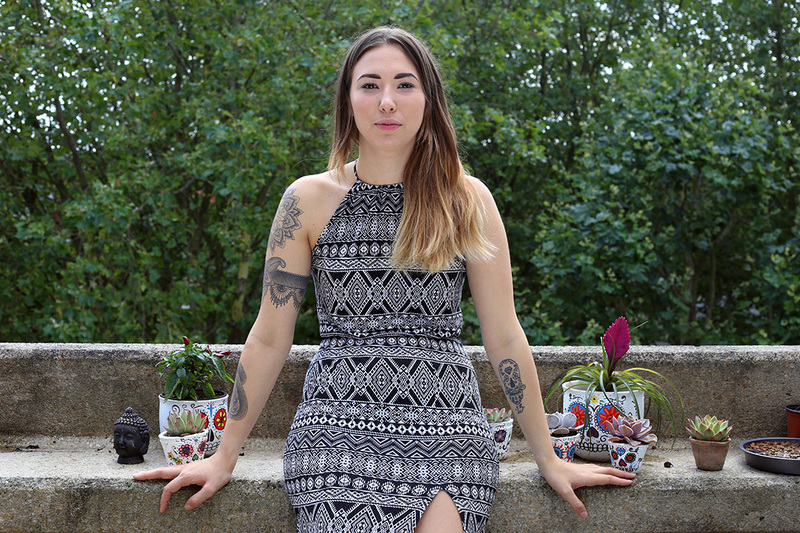 Do you see tattoos as art? Yes, one hundred per cent. People often worry about the permanence of tattoos. 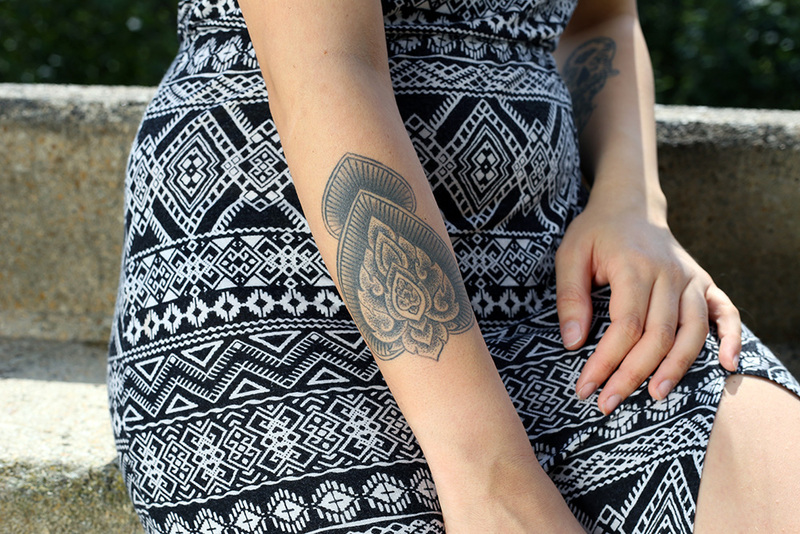 How do you feel about the fact that your tattoos are a permanent part of you?